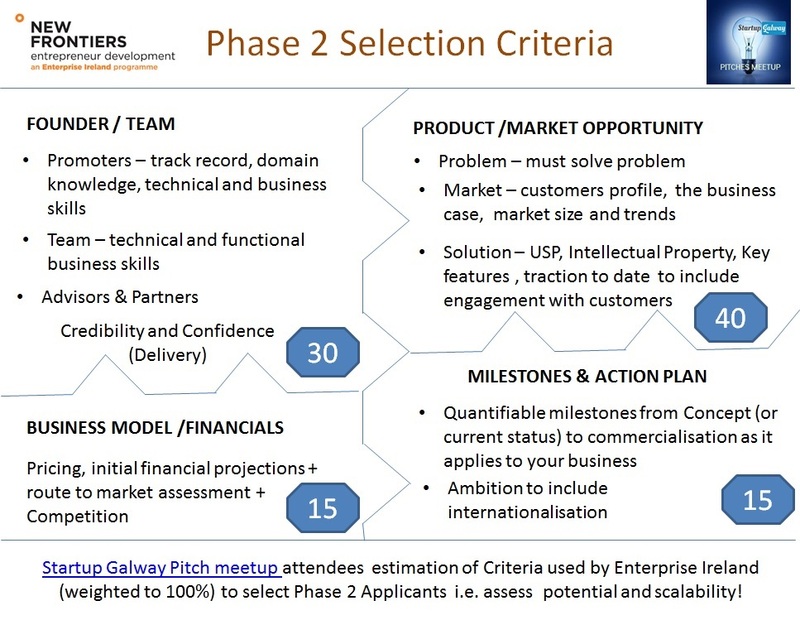 What Enterprise Ireland are looking for in a New Frontiers Phase 2 Application? Are you participating on one of the Enterprise Ireland New Frontiers Phase 1 programmes being delivered by the Incubation Centres in the Institutes of Technology in Ireland? If yes, you may have started completing your Phase 2 application. As a trainer on the programmes in WIT, IT Sligo and GMIT, I would like to share some thoughts on what I think Enterprise Ireland are looking for in a New Frontiers Phase 2 participant /business. Originally published in 2013, this article has been updated and revised in 2019. Enterprise Ireland has a fantastic track record of supporting HPSUs (High Potential Startup Companies). New Frontiers is an investment in creating a pipeline of potential HPSUs across all regions in Ireland. The ability potential to create jobs in Ireland is the number one requirement. These Value Creation and Value Realisation equations presented below, as espoused by Tony O’Kelly, New Frontiers Programme Manager in GMIT, will assist us to drill down to see how this ‘potential‘ is assessed at an early stage. most startups fail not because they don’t manage to develop and deliver a product to the market; they fail because they develop and deliver a product that no customers want or need. The very first issue for every early stage startup is to identify ‘a burning problem’ for a specified customer segment. 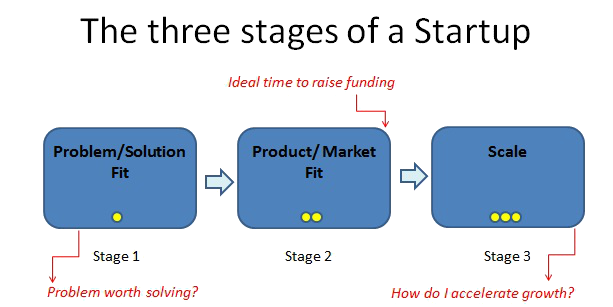 In Running Lean, Ash Maurya presents the three stages of a startup. I suggest that applicants to New Frontiers Phase 2 should focus on showcasing in their application that they have achieved Problem/Solution fit. You need to ‘get out of the building’ and talk to potential customers. You need to figure out if potential customers and end users have a problem worth solving – will they pay for your solution and are they already paying for some solution. Is this a ‘must have’ rather than a ‘nice to have’ offering. The key at the early stage is to ask customers to identify the problems that they are experiencing rather than to ask them what they think the solution should be or entail. My background is Marketing. I have met with lots of startups so I have a working knowledge of technology. In 99% of cases, if there is a problem, a team of scientists or engineers or other experts can find the solution given sufficient resources. I suggest that applicants to Phase 2 should focus on proving in their application that they have the wherewithal to develop a viable solution (as opposed to creating a demo). They will also need to highlight how this solution can be protected and not easily copied (Intellectual Property is a huge advantage). It is also important to explain the technology without too much jargon. One way to do this is to outline a Use Case Scenario for a typical customer. The first two elements of Tony’s formula: Problem and Solution combine to create Value for a Specified Target Customer Segment.The easiest way for New Frontiers Phase 2 Applicants to demonstrate that they have identified a market niche is to cite relationships with Reference Customers, whether they be in business (B2B) or consumer (B2C) markets.Secondary research outlining market size, trends and major competitors will complete the picture. The ideal scenario is a growing market or sub-market where customers and third parties value innovation as opposed to focusing exclusively on cost. The value that you create for your customer can take many forms. For B2B, the easiest value to communicate is when your solution leads to increased Sales, or results in cost (also measured in time) savings. For B2C, value results from a gain of something positive or a reduction in something negative. But there is no need to focus exclusively on ‘logical’ value or serious problems. There is a difference between what people ‘need’ and what they ‘want’. Businesses may feel that they need to prove that a valid need is being served. I agree with this sentiment, but would add that if you can find and access a cohort of customers with similar interests and worldviews, and can deliver on an unserviced ‘want’ in less serious domains, then there could be the basis of a sustainable business. The key issue in the Value Creation equation is the level of pain experienced by customers. For your Phase 2 application, you will have to convince the EI panel that a Target Customer Niche is willing to pay for your solution (or iterations of it) – i.e. that their pain quotient is sufficiently high. Jim Collins in his book ‘Good to Great‘ emphasised the requirement to ‘Get the right people on the bus’. Each New Frontiers Phase 2 application will be assessed to see if the team has the mix of skills required to bring the business to the next level. Domain knowledge, technical and commercial experience and expertise will be assessed. A strong application will outline milestones that have been achieved to date as testament of the value of the current team. It is also important to identify gaps in the team and ideally how and when these will be addressed. At an early stage, start up promoters need to leverage the value of the ‘Non-traditional team’ to include mentors and experienced business advisors and professionals. A business model describes the rationale of how an organization creates, delivers, and captures economic value…… The business model canvas is a shared language for describing, visualising, assessing and changing business models. A Business Model defines how a business makes money. But, it is about more than Pricing and Routes to Market. The Business Model Canvas facilitates the presentation of your business on one page by challenging you to think about 9 building blocks of every Business Model. The business model generation book uses brilliant examples to outline business model patterns and also provides techniques for creating a business model for your business. Ash Maurya was inspired by this work to create the Lean Canvas – in this blogpost he explains why he replaced 3 of the 9 original building blocks for his canvas. The value of whichever Canvas you choose is the ability to capture the same core elements you find on a business plan, but because it fits on one page, it’s a lot more concise, portable and readable. I highly recommend every startup to use (for free) the Leanstack.com tool. There are super step by step instructions to include videos by Ash Maurya on how to complete a canvas for your business. The Enterprise Ireland panel will be assessing both technical and commercial milestones in each application. where product/ market fit is achieved when a product solution shows strong demand by passionate users representing a sizable market. New Frontiers is designed to assist male and female entrepreneurs, who have an innovative business idea and the ambition to create a growth focused business. As a promoter your job is to submit a strong application form for Phase 2 of New Frontiers – one that presents the Early Stage Business Case (13 factors). In New Frontiers, Enterprise Ireland and the IoTs have a proven model to assist startups. The progress of participant businesses over its tenure is testament to its success. As such, I highly recommend New Frontiers to startup promoters with businesses that fit the criteria. Present a roadmap with realistic commercial and technical milestones in order to realise the potential of the business. EI has not published their Weighted Selection Criteria for New Frontiers. Last year in Galway at a Pitch meetup which I facilitate, a group comprising of New Frontiers GMIT alumni and applicants who had just completed Phase 1 discussed this very issue and created this graphic – this is not endorsed by Enterprise Ireland but do you agree? If you get called to Phase 2 Interview stage, I think that this will inform how much time should be spent on addressing and communicating the many elements of your business. I hope that you find this blogpost of benefit when completing your Phase 2 application. All comments welcome. Hi Donncha brilliant thanks for the mention we seem to be moving in the same direction ill send you a link. Might Surprise you. Graham – I look forward to reading your post on this topic. Not surprised we are still moving in the same direction. Great piece of work Donncha! Thanks Lisa – and well done to all your team in Enterprise Ireland for making New Frontiers a big success. Donnacha – really useful, thank you for the tips and overview. Delighted that you found the article useful, Tara. Great to see an experienced business promoter benefiting from my post. Completing the application does take time but I think that the questions are valuable in their own right as they help potential programme participants to clarify issues relating to the business in their own heads. They also challenge you to think about the full range of business issues. I’m finding it helpful to stay focused on what I need to put into my applciation. Do you have any suggestions on how to translate a lean canvas to the Business Model section? Do we just turn the 9 sections in the canvas into prose in the application? What else should we add other than the 9 sections? Cathal, thanks for your comment and interesting question. I would firstly suggest that the Lean Canvas be attached to a Phase 2 Application. I would then suggest that they be treated separately. To answer your question on how to answer the business model question, Section 4 of the application specifically 4.1 asks about the proposed business model. The first issue the reader will be wondering about is Price. Give an indicative price (even if it is a range) as that draws a line in the sand. This gives some idea of position in the market and how you might compete and differentiate as per the question (which covers a lot of bases). The next key issue is Route to Market which again gives a clue to scalability. I would mention partners and explain level of engagement to date. You might have two models depending on time horizon, direct sales initially with partners coming on board when traction is achieved. The application does not request detailed financials but if the business has credible information on margins and costs this would be a good place to include. So the prose for the business model really only deals with two or three of the 9 building blocks on basis that application deals with other issues elsewhere. and possibly 9. Unfair Advantage. Finally, slightly off the point but crucial nonetheless, the Lean Canvas is not a replacement for Financial Projections – for New Frontiers Phase II, you will need to communicate in the application that your business has potential to meet turnover targets expected of clients by Enterprise Ireland. Equally, you will need to represent understanding of costs associated with revenue targets expected of clients by Enterprise Ireland (e.g. Patents & NPD, Personnel, Marketing). 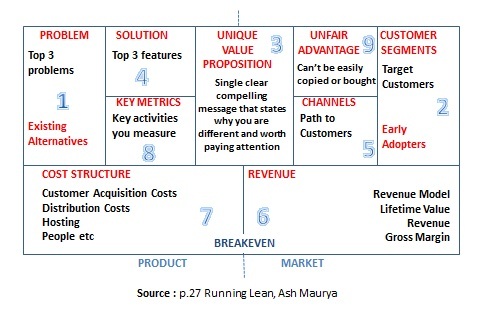 The ‘problem’ with the Lean Canvas is that if used correctly (as intended by Ash Maurya) you are talking about a short time horizon of maybe 3 to 6 months. He talks about a short runway which is useful as you have limited resources. But the New Frontiers panel are also looking for indications of ambition – as such it is critical to treat the lean canvas and application as separate documents. Best of luck with completing application. Nice article but my experience is slightly different in terms of lean start ups. I probably misunderstood the New Frontiers, but it is not for lean start ups. Thanks for your comment which I have approved as while controversial I think it adds to the debate. I am not sure which New Frontiers you applied to so I am responding on behalf of the evaluators or indeed on behalf of EI. I would not agree that EI does not get ‘Lean Startup’ but I would agree that New Frontiers is not specifically structured to follow a lean startup model step by step. I think that EI and New Frontiers do understand Lean and use some of the tools to help businesses on the programme to: Validate the market; define their business model; engage with customers; and finally to prepare a business plan that will be required if external investment is required (and it normally is). The application form for Phase 2 does indeed look for financial projections in order to ascertain the ambition and vision for the company. Detailed financial projections are not specifically required. The application (in GMIT and I presume it is the same across the country) only asks for top level numbers as opposed to a spreadsheet. Secondary market research is not about fictitious numbers and is a very important topic (but that is a blogpost in itself). I am sorry that you think that the jargon of the assessors is nothing but lean. I presume you were not particularly happy with the feedback. I actually think that jargon should be avoided as per this blogpost. But I do agree that giving feedback is a skill and is very important for applicants. If I was an assessor on New Frontiers I would equally have difficulty with an IT Services proposition as it is difficult to see scalability. But it is possible as evidenced this week by Version 1 who raised €8 million investment. They are an EI Client and aim to have 1 billion in revenue in the next ten years but it is interesting that the company was founded in 1996 giving them an 18 year track record. I think that EI do understand the advantages of the Cloud but the Cloud is only a vehicle and the key issue for each NF applicant and indeed Lean Startup is to identify a Problem and Solution for a real customer base. To conclude, I don’t think that EI or New Frontiers declare that they know everything about how to help every single startup but they have great experience and track record. As such, I think that the programme managers are open to embracing lean startup thinking in their support model. Indeed, a lot of the lean startup approach fits with the model that the programme and its predecessors have followed for over a decade.